So one of my cousins suggested to me that I should draw Yuno from Future Diary, and since I configured a blood brush somewhat recently I decided to give it a try, and I have to say I'm glad I did. It's been quite a while since I last drew a yandere character, I used to love drawing crazy expressions all the time back then and I didn't realize how much I've missed them until I started this. Also, the blood brush in SAI is awesome. Drawing yanderes with blood is so much fun, it's quite a nice change of pace considering the fact that most of what I draw nowadays are mostly just cute/pretty girls. It's also my very first time doing blood, but I think it's safe to say that I pulled it off perfectly. I also wanted to try out another thing I've never done before, which is playing with lights & shadows. I've always wanted to draw something with dramatic lighting but I never found the right opportunity to actually do it until now. By the way, I realize that the way I made the lighting is probably all kinds of inaccurate, but I did it on purpose because I like it this way. You can see the progress shots here. 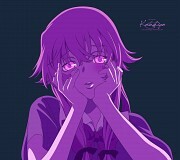 Browse Mirai Nikki Gallery: Recent | Popular.